Magerealm, the high action MMORPG from GTArcade, is ready to introduce a new Hero! Introducing Shadow Guard, a warrior shrouded in mystery that uses the power of the shadows to augment his ability to mitigate damage. Shadow Guards originate from the ancient order of Battlemages. A Shadow Guard is a battlemage that has chosen to focus solely on mastering the discipline of shadow magic. But unlike other practitioners of this type of magic, Shadow Guards relies on its elusive properties not to avoid combat, but to face it head on and stand their ground. The strongest attacks will turn into glancing blows when contorted by the shadows. To a Shadow Guard, the shield is an archaic tool for fools. As a defensive tank Hero, the majority of Shadow Guard’s skills have a main or side effect of increasing his survivability. Both his Shadowmeld and Dark Refraction passively increases his damage reduction, significantly reducing all incoming damage. His Dark Barrier skill has a relatively high chance of putting a powerful shield on his entire team with each of his attacks. 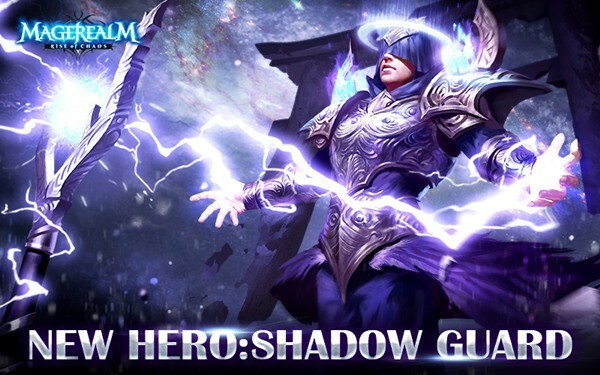 Shadow Guard’s Oblivion skill not only deals heavy AOE damage to all enemies around him, but also greatly reduces their chance to hit, further increasing his own survivability. Shadow Guard’s skill set makes him the perfect tank for your team.